There hardly could be something more Irish than endless and pure Connemara landscapes and traditional sean-nós singing that releases the very soul of the Emerald Island. This year Moscow Irish Week hosted the 11th Irish Film Fest that brought Gaelic-speaking Song Of Granite on screen. 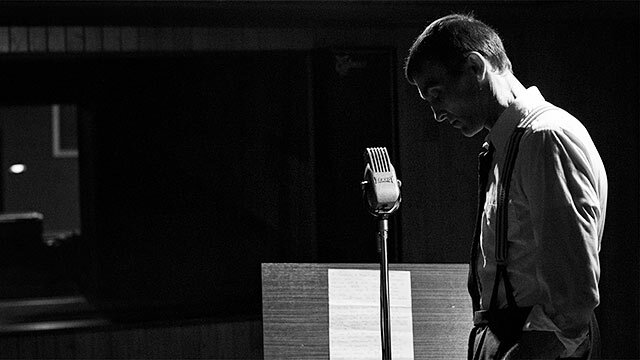 The film by Pat Collins rebuilds the biography of famous sean-nós singer Joe Heaney (Seosamh Ó hÉanaí) who spent his life wandering the world with motherland in his heart and deep affection to Irish tradition in his unique singing. Hasteless, contemplative, like a Connemara river flow, Song Of Granite is a special piece of art that definitely is worth seeing: besides Gaelic language that dominates in the film (actually the script was written in Gaelic only), it combines both action film and file footage, all the scenes are made in rare and exquisite monochrome palette, and there are just a few professional actors in the cast – almost all parts are performed by singers, musicians and local folks. 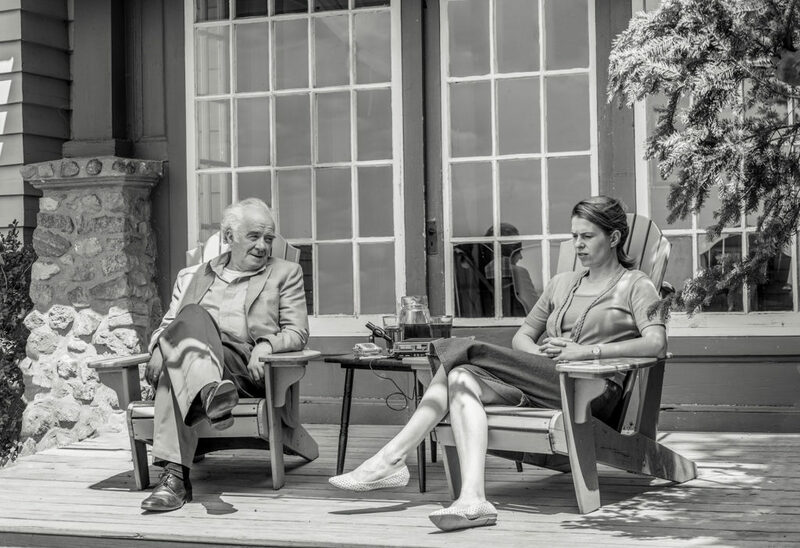 How it was to relate a life-long song of Joe Heaney on screen, and what elements shaped the picture as we see it – that`s what we were talking about with Richard Kendrick, the film`s Director of Photography. Previously working with Pat Collins on documentaries, Richard Kendrick was happy to cooperate with him on a biopic. For him Joe Heaney is a kind of a Jekyll-Hyde person: while being an appraised genius at traditional singing, he left his wife and four children in Glasgow for no evident reason and traded his settled life for faraway uncertainty in New York and lately in Seattle where he died alone, missing sweet home Connemara till his last day. “Pat Collins has made a great job of not being judgemental”, Richard remarked talking on this matter at the Q&A. Anyway, Heaney as a man of great talent and mysterious mind was quite an example of many of those Irish rovers who travelled across the ocean in pursuit of better life, in attempt of getting rid of poverty and despair. Heaney spent his early years in a remote Connemara village in the west of County Galway, on the kindless Atlantic coast beside the hollow mountains crossed by turf moors and beautiful lonely valleys. Although today Connemara is a special region of national reserve, Richard told it was quite a task to find there a proper shooting location to depict 1920-1930ies, there is not much left untouched by now. Finally they have chosen a village abandoned in 1970ies, and some scenes were shot on an island with no electricity and no harbor, so local folks helped the cast and crew to cross the bay. 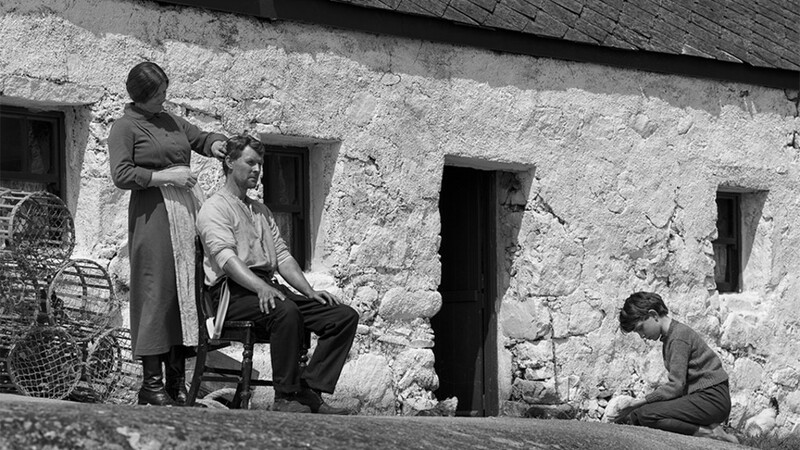 This natural picture brings a special spirit to the film, and Richard confirmed that there was no discussion about making Song Of Granite in color – Pat Collins and his wife Sharon Whooley, the screenwriter, made an album with Connemara most picturesque locations first, and it initially was black and white, so the film went monochrome too. “There still is some modern stuff in Connemara, so black&white helped to hide it”, Richard told us, “As for the Director of Photography it was a unique opportunity to make a black&white action film”. 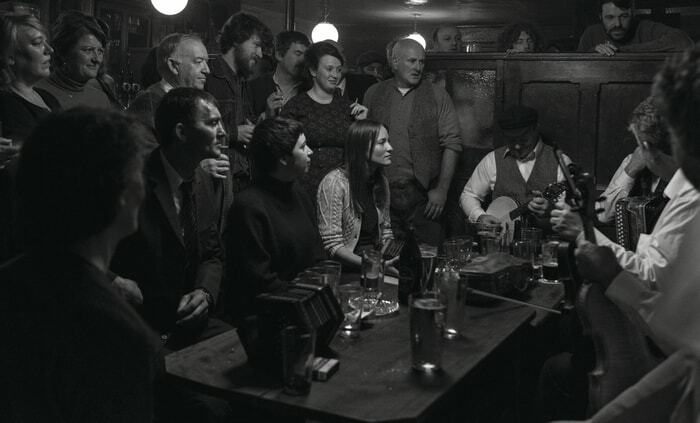 Other locations look stylish in black and white as well: Dublin pub sessions were shot in actual pubs with real musicians, Richard used hand camera to create the effect of presence, and sound producers made live records right on set, no single song in the film were re-dubbed later. Except of the color palette there was another peculiarity about the filmmaking that Richard highlighted as a challenge for a cameraman: almost all of people in scenes are not actors at all. Pub singers, village folks – they all actually play themselves. But the most thrilling non-actor performance was shown by a young sean-nós singer Colm Seoighe. 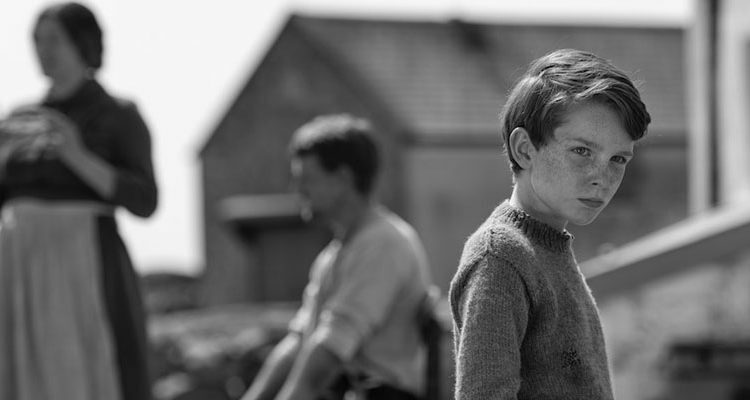 We see ‘three ages’ of Joe Heaney in the film, Colm begins this story with a brilliant and profound portrayal of an Irish boy who learns life as it is: hard work from dawn till night, fishing, turf extraction, building walls of stones to protect the village from merciless Atlantic winds and divide grasslands. His pure childhood is wandering around endless and never boring Connemara lands, following the thread of his sweater lost in dappled grass (I`d never find words better than W.B.Yeats did). Colm proved to be not just a talented singer, but also an actor who, despite of youth, caught tiniest details of his character: shyness, sensitivity, being quick on the draw while listening to his father singing or elderly home-folks telling old legends. The second stage of Heaney was portrayed by Michael O’Chonfhlaola, a famous traditional singer who like his younger colleague has never taken part in action films. His sharp performance enhanced by powerful voice drives on-screen Joe Heaney with the inspiration of the road far away from home, as long as a chain of verses of a traditional Gaelic song. The actor for the third age of Heaney, acclaimed Macdara Ó Fátharta, had to back off a little in his acting to be in sync with his colleagues, but it had never affected his performance. The film was shot in West Ireland, in Dublin (including Scotland scenes) and in Montreal (the late Heaney`s years in New York where he worked as a doorman, and his last days in Seattle). Richard Kendrick told that they discussed the idea of shooting on film, but then decided to make it digital. For incredible panoramic shots in Connemara he used lenses only twice, just to create the impression of endless movement or landscape. See it with your own eyes to unveil the mysterious Irish soul linked to its motherland, no matter how far from home it could be. P.S. Song Of Granite was officially selected at the Karlovy Vary International Film Festival and the BFI London Film Festival in 2017, its world premiere was held at South By Southeast Film Festival – 2017 in Austin, Texas.